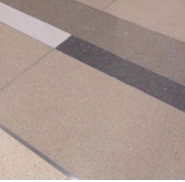 In celebration of the most interesting, creative, beautiful, and appealing terrazzo floors completed by NTMA contractors, the NTMA recently announced its 2015 NTMA Honor Award winners. 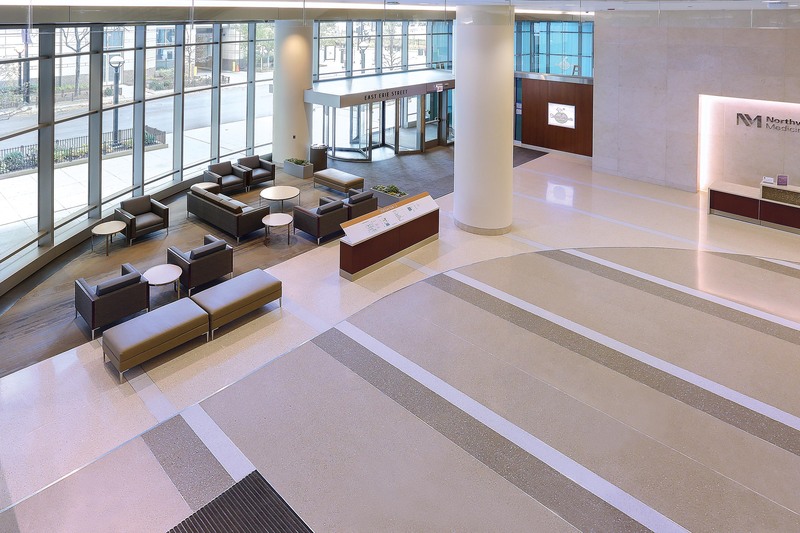 The NCTA is pleased to announce that two of its members won honor awards for their exquisite work: Menconi Terrazzo and Michielutti Bros., Inc. 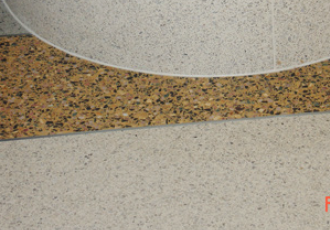 This annual competition honors the best terrazzo installations completed within the last year. A panel of five industry experts and experienced designers use this criteria to score the project based on photos and a job description. The project’s name, location, terrazzo contractor, and all other parties involved with the project are kept secret. At the University of Michigan’s Biomedical Science Research Building, there is an emphasis on intellectual collaboration and innovation. This spirit carries over into the building’s architecture with a clean, modern design that represents different scientific themes rather than individual departments. The building’s lobby serves as the well-traveled heart of this collaboration, connecting laboratories, faculty offices, and seminar rooms together. 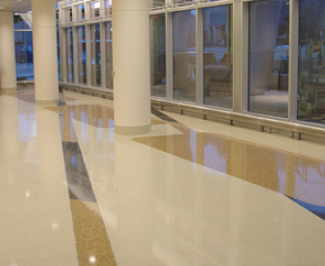 Terrazzo’s durability and flexible design provided the necessary attributes to stand up to high traffic while meeting the modern design requirement. An eye-catching four-color linear pattern is featured in the lobby, using the classic UofM blue and gold and a pristine white background to create elegant pathways. Pockets of colors are used to indicate meeting spaces along the 20,000 square feet of these pathways, reminding visitors of the building’s collaboration intent. “Stripes within stripes are superimposed on a large strip of another angle and interspersed with random, abstract cloud forms, creating a sense of space and spaciousness,” Bob Michielutti of Michielutti Bros., Inc. said. 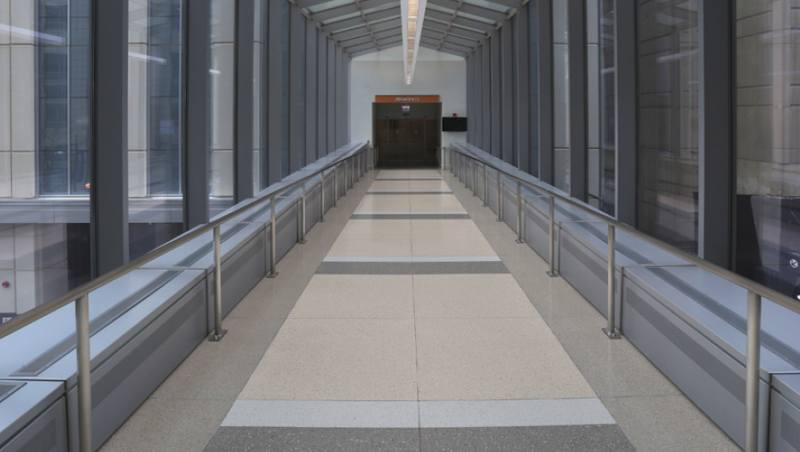 For its new Outpatient Care Pavilion, Northwestern Memorial Hospital needed a public space that would connect the new building with the existing buildings on the healthcare campus. 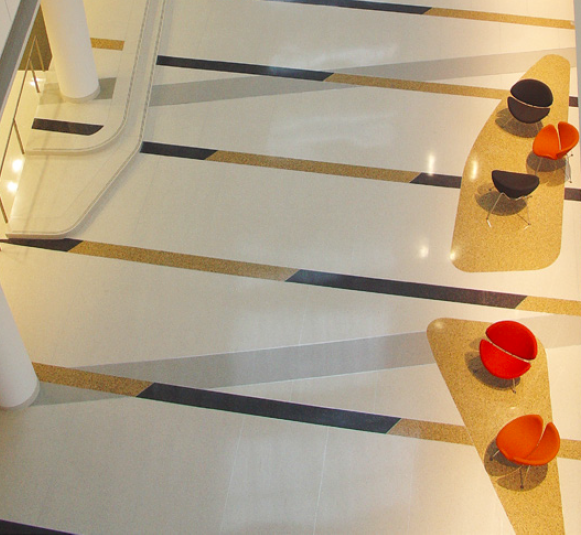 To create the flowing pattern necessary to guide visitors through the space, terrazzo was used to tie together the old and new in a classic, yet contemporary way. They incorporated old and new with curve, bar, and band designs in neutral colors. Kimberly Cook, associate vice president at CannonDesign, said the combination of these design aspects with the building’s architecture helped to create a better sense of flow. “We brought the two elements of organized geometry and curving organic form together to bridge some of what was happening in the building and on the Northwestern campus overall,” she said. 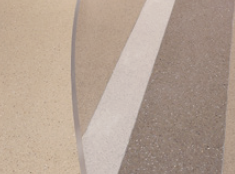 The subtle, neutral colors were chosen to create a dynamic pattern that would create the effect the hospital was after. “The only material we felt could accomplish the organic shape in a successful and impactful manner was terrazzo,” Cook said.